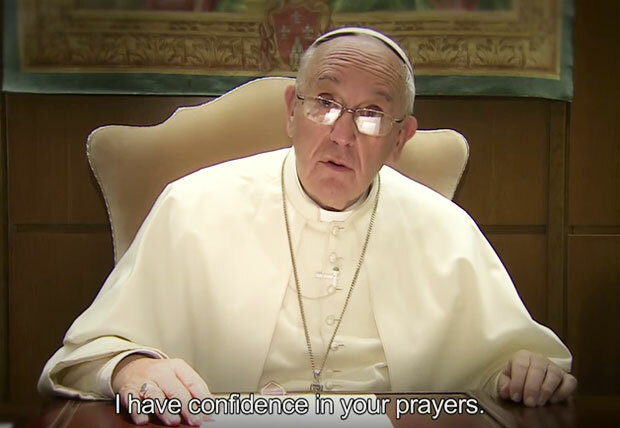 Pope Francis appears in a screen shot of his Apostleship of Prayer monthly video. Pope Francis has introduced a new twist on an old practice of prayer. Since the 19th century popes have asked the Apostleship of Prayer to convey papal prayer intentions each month and encourage all people to join in daily prayer. Now, in addition to the text prayers, CatholicPhilly.com offers a monthly video of Pope Francis’ prayer intentions. Watch this month’s video here, in Italian with English subtitles, and pray the prayer intentions below. That by means of dialogue and fraternal charity and with the grace of the Holy Spirit, Christians may overcome divisions. CatholicPhilly.com invites you to join Christians worldwide to pray with a reflection and Scripture citation on the website of the Apostleship of Prayer. The prayer network was founded in 1844 to encourage Christians to make a daily offering of themselves to the Lord for the coming of God’s Kingdom and for the pope’s monthly intentions. THe video of Pope Francis brought tears to my eyes. I do not cry readily. THe sincerity of our Holy Father is so obvious. Pope, Pope Francis, never be forgotten.